-Moon Tiara Magic: Converts Tiara into a Frisbee-like weapon which went from destroying enemies to just knocking them down. -Moon Healing Activation: Activates the cosmic crescent wand which converts monsters back to their original form if had original form. -Sailor Moon Kick: says this when doing kick. -Cosmic Moon Power: Says this when using the Cosmic Crescent Wand with the Imperium Silver Crystal. The crystal itself is an object of great power. 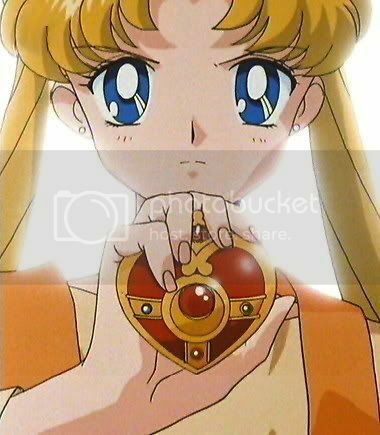 -Moon Crystal Power: Same as Moon Prism Power. -Moon Scepter Elimination: Activates the power of the Moon Scepter to eliminate enemies. -Sailor Body Attack: Throws herself against the opponent. -Moon Spiral Heart Attack: Attack using the Spiral Heart Moon Rod. -Double Sailor Moon Kick: Attack the Sailor Moon and Sailor Chibi Moon use together against enemies. -Star Light Honeymoon Therapy Kiss: Eternal Sailor Moon's attack using the eternal tiara. Turns enemies good again. 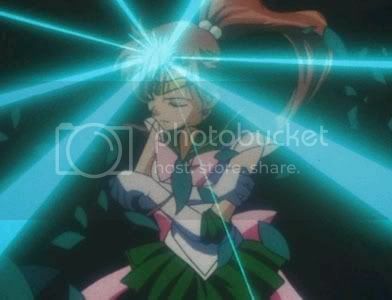 -Mercury Power/Mercury Power, Make Up: Amy/Ami says this to transform into Sailor Mercury. -Mercury Bubble Blast/Shabon: Spray Sailor Mercury says this in order to generate a mist fog that reduces the visual range of enemies. This generally confuses them, making them more vunerable to attacks. Amy/Ami says this to transform into Sailor Mercury. -Mercury Ice Bubble Freeze/Shabon Spray Freezing: Sailor Mercury says this to use her bubbles to freeze an opponent. 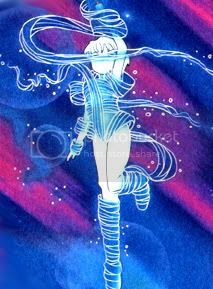 -Mercury Ice Storm Blast/Shine Aqua Illusion Sailor Mercury says this to generate a massive freezing attack. This will usually freeze opponents and/or objects, preventing them from moving. Mercury Crystal Power, Make Up: Ami says this to transform into Super Sailor Mercury. Minako says this to transform into Sailor Venus. Sailor Venus says this to generate a chain of energy. She can then use this to trap an enemy within the confines of the chain. Sailor Venus says this to generate a massive rotating heart directed towards an enemy. Minako says this to transform into Super Sailor Venus. 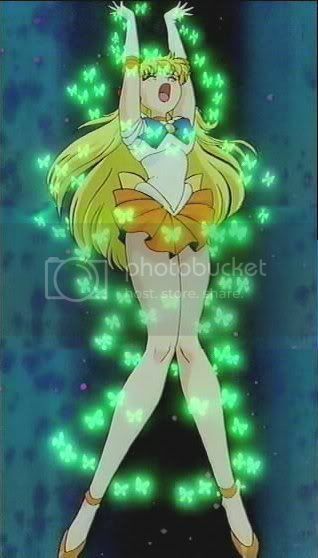 This is Super Sailor Venus' attack. Raye/Rei says this to transform into Sailor Mars. Sailor Mars says this to create a burst of fire. This fire can then be controlled, as a fire stream (standard attack) or it can be used to supplement the attack of other items (specifically, Moon's Tiara). paralyzed, making them more vulnerable to attack. Sailor Mars says this to create a blast of flame shaped in the form of a fire-bird. This firebird can then fly towards its intended target. Sailor Mars says this to launch several rings of fire that surround the enemy. Lita/Makoto says this to transform into Sailor Jupiter. Sailor Jupiter says this to activate her tiara to capture lightning bolts. She can then redirect this energy into an electrical bolt with which she can attack. Sailor Jupiter says this to create a lightning Dragon which destroys her enemy. Sailor Jupiter says this to generate an energy bolt which she throws at the enemy. Sailor Saturn says this to control countless amounts of ribbons which slash away at her target. 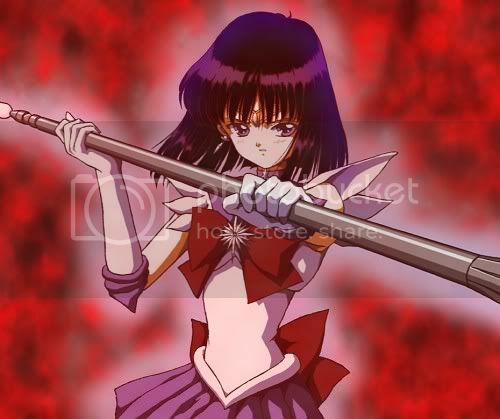 Sailor Saturn says this attack... there is a pause of total Silence, then a large explosion which destroies the enemy. Hauka says this to transform into Sailor Uranus. Sailor Uranus uses these words to generate a yellow ball of energy, which has all the devasting effects of an earthquake. Michiru says this to transform into Sailor Neptune. Sailor Neptune says this to call up a massive funnel of water, which she can direct at an enemy. Sailor Neptune appears with her mirror. She twirls around while holding the mirror saying 'submarine reflection'. She turns the mirror around to face the enemy. A beam of light emits from the mirror and shoots at the enemy. Setsuna says this to transform into Sailor Pluto. 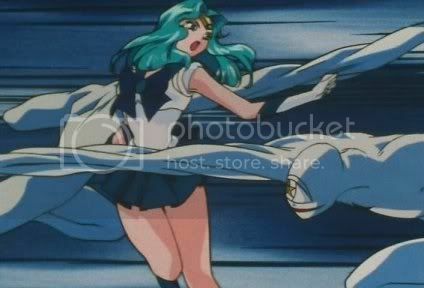 Sailor Pluto produces a massive sonic scream which can disable opponents and destroy various structures. 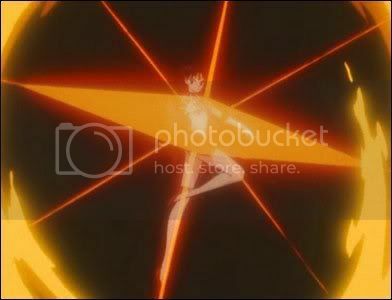 This is Sailor Pluto's forbidden attack, used to close the passage of time. -Luna P Kitty Magic: Rini/ChibiUsa says this to turn Luna P [her Luna-look-a-like toy ball] into an object of her choice. 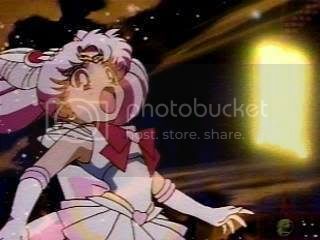 -Pink Sugar Heart Attack: Sailor Mini Moon says this to cause small heart-shaped fireworks to come out of her Moon Rod. This attack is mainly used to distract or irritate enemies. -Twinkle Yell: Super Sailor Mini Moon says this to call upon the Pegasus with the Crystal Carillon. When he comes, he gives Super Sailor Moon the power to use her Kaleido Moon Scope against an enemy.